As a life long book nerd, I have also been a book purist for most of my life. I like books. And by that I mean physical books. I like to hold them in my hand. I like to smell the pages, bookmark, highlight, underline, make notes in the margin, stare at the cover design. I believe in holding books. That is until I read 1Q84. Then I realized that e-readers might be on to something. Still I have never read a single book on a digital device, until now. At any given moment in my life, there are a myriad of jumbled ideas I want to examine, stories, articles I want to read, pictures I want to take, apps to download, recipes to try and games I want to play. iBook has been one of them for some time now. I really admire the fluidity with which my best book nerd friend at Life as I Know It purchases books on her Kindle and speed reads through them in a matter of days, sometimes hours. But like I said I’ve been anti e-reader since they were released. I think she has been the one person to show me how e-readers are actually not evil. And now I think they might actual be one the best uses of technology ever. She has told me that I have to read “Americanah” by Chimimanda Ngozi Adichie and usually when she recommends a book it means I need to read it. 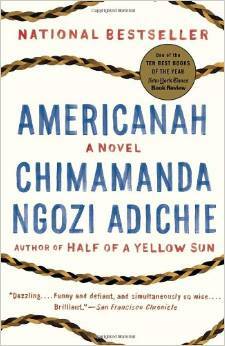 I uploaded a sample of “Americanah” on my iBooks app last week. Perhaps one of the truest testaments of a great writer lies in their ability to transcend the format through which they are communicating. And I have to say that reading Chimimanda’s words on my iphone, I had not one care for the fact that I was not turning pages or holding her actual book in my hands. I was transported to a very familiar world through the eyes of an African woman. And I am enraptured at her brilliant and insightful observations of American, Band immigrant life among many other things. Her attention to detail, her honesty, humor, lyricism and down to earth tone are engaging and eye opening. I’m only in the first chapter still but I can already tell I’m in it until the last page. This will be the first book by Adichie I’ve ever read but like many of us I became aware of her by way of Beyonce’s “Flawless” track. Since then I have watched and listened to her in talks and Ted X lectures and seen the film based on her book “Half of a Yellow Sun” about the lives of two upper middle class Nigerian sisters during the Biafran war at it’s debut in Lincoln Center this past Spring. I don’t say this about people in the public eye often but whenever I see Adichie, I feel as if she is someone I would love to sit down and talk with or better yet, someone I would willingly approach to engage in conversation. And I rarely feel that way about people which is why its easy for me to recognize when someone makes an impression. I continued reading “Americanah” at lunch in an Indian place called Baluchis where I’ve only seen Black people working and Drake’s last album played over the stereo. Reading her main character’s observations about the cultural spaces she navigated in America made me more sensitive to my own and what they really mean, how they shape what I think and how I feel, what I believe about who I am and what it means to belong anywhere. I’m only on the second chapter. LOL!